Buenos Aires at the end of the 19th century was a vibrant city. As a political and commercial hub of Argentina, it was a magnet for immigrants from the Old World with a growing demand for unskilled labour. A large scholarship has studied immigration to Buenos Aires and to Argentina during the era of mass migration (Moya 1998, Baily 1999). However, we lack, so far, detailed quantitative knowledge on the impact of these flows on labour market. 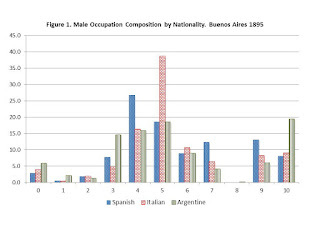 In particular, we are interested in comparing the relative performance of the native workers vis-à-vis the Italian and Spanish immigrants, the largest two immigrant groups, throughout the era of mass migration in Argentina. 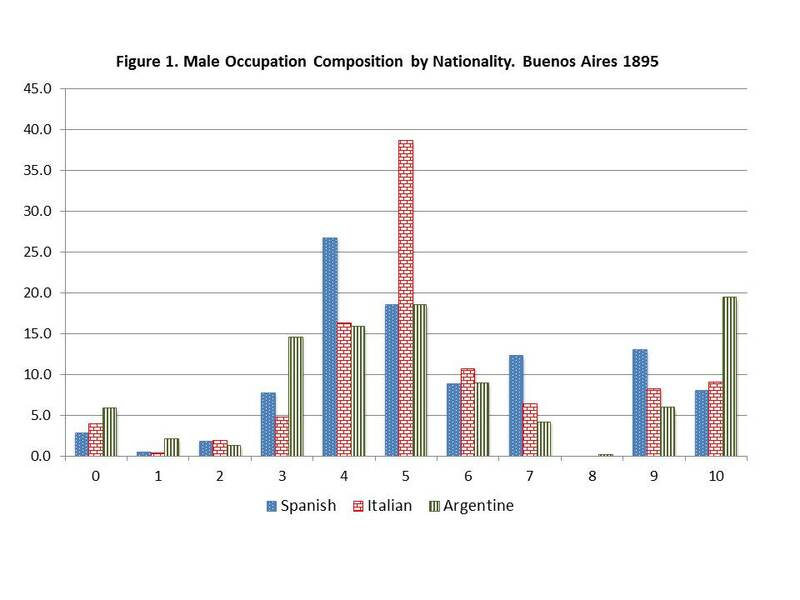 Buenos Aires in 1895 is an extreme case in immigration; the influx of immigrants was so important that only one-third of the male labour force was of Argentinean origin. In 1895, Buenos Aires had nearly 664,000 inhabitants, more than half were foreigners. Using a new dataset combining individual level census data and a wide array of skilled and unskilled wages, a new EHES working paper looks at labour market participation, human capital, and wealth to assess the performance of Argentineans, Italians, and Spaniards. By classifying the different occupations according to the 1950 IPUMS classification used for the US census, we are able to analyse the labour market in terms of skill composition and skill return. The findings point at complex effects of immigration on the urban labour market. (We restrict our analysis to adult males given the data constraints on female wage data). Native workers enjoyed, on average, higher wages than Italians and Spaniards. The labour market rewarded literacy as we observe higher wages rates in more skilled occupations with a higher share of literate workers. Yet, we do not observe systematic native skill upgrading throughout the skill range. In contrast, one distinctive characteristic of the labour market was the relative concentration in different occupations by nationality. 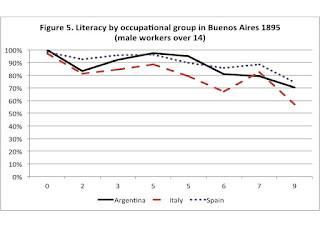 Argentines dominated the higher skilled occupations while the Spaniards concentrated in the retail sector and the Italians in the artisan sector. To explain this distribution, we look at the individual characteristics to find that variation in literacy is not consistent with this clustering. 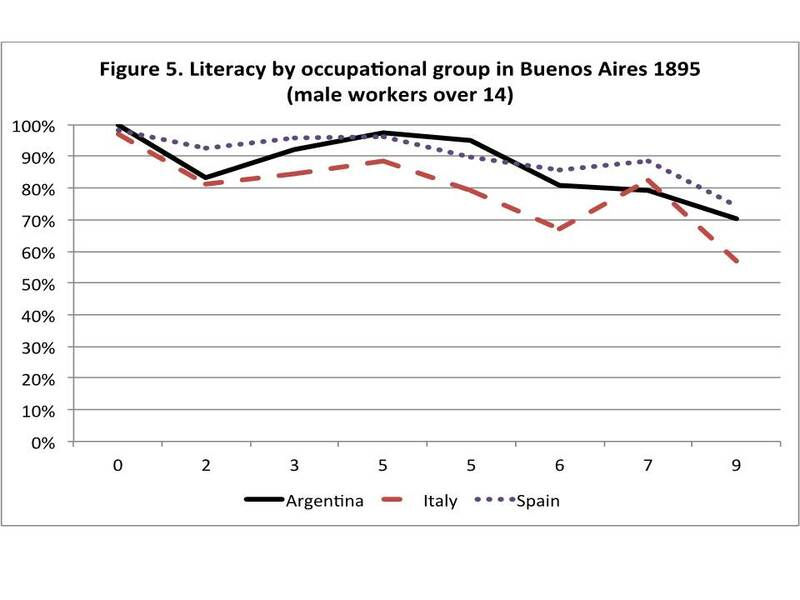 Both Spaniards and Italians enjoyed relatively high literacy rates. Following the migration literature, we explore the role of networks as catalysts for integration in the host economy. Ethnic associations played an important role serving as hubs of information and networking and thus decreasing the costs of integration to the new economy. A comparison between the extent and history of local associations shows that the Italian community had a deeper and long-established network in Buenos Aires. Overall, this study contributes to our understanding of the performance of labour markets in the presence of large immigrant flows. Buenos Aires at the end of the 19th century welcomed thousands of immigrants. Between 1887 and 1895, these immigrants explain 70% of the total population growth. In this flexible labour market, immigrant workers found their niche based on their skills and aided by the existing networks. With older and deeper network power, Italians had the first mover advantage, a benefit that allowed them to succeed in their adopted country. 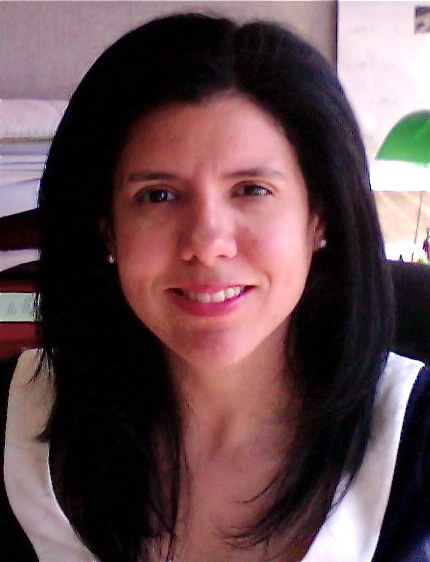 This blog post was written by: Leticia Arroyo Abad and Blanca Sánchez-Alonso, Department of Economics, Middlebury College, Vermont, USA and Blanca Department of Economics, Universidad CEU-San Pablo, Madrid, Spain. The authors thank Timothy J. Hatton and Javier Silvestre for very useful comments and suggestions. This paper also benefited greatly from discussion in the Economic History Seminar of the Universitat de Barcelona and the XI Conference of the European Historical Economics Society (Pisa). Baily, Samuel L. (1999). Immigrants in the Land of Promise: Italians in Buenos Aires and in New York City, 1870 to 1914. Ithaca. New York: Cornell University Press. Borjas, George J. (2003). “The labor demand curve is downward sloping: Reexamining the impact of immigration on the labor market”. Quarterly Journal of Economics 118, 4, pp. 1335–1374. Hatton, Timothy J. and Williamson. Jeffrey G. (1998). The Age of Mass Migration. Causes and Economic Impact. New York: Oxford University Press. Moya, José C. (1998) Cousins and Strangers. Spanish Immigrants in Buenos Aires, 1850-1930. Berkeley: University of California Press. Ottaviano, Gianmarco and Giovanni Peri. (2012). "Rethinking the Effect Of Immigration On Wages," Journal of the European Economic Association, 10(1): 152-197. University of Barcelona from December 3-4, 2015. Two keynote lectures and 16 presentations focused on the workshop theme “Economic History of Education” and constituted a dense and inspiring program. The meeting started off with a very inspiring keynote by David Mitch (UMBC Maryland) giving an overview on how the field of “Economic History of Education” had developed during the last 50 years. The keynote’s guiding idea was to contrast the “Economic History of Education” with the developments in financial economic history. When Francesco Cinnirella (ifo Institute) concluded the meeting with the second keynote, focusing on the developments in the field during the past decade and outlining the open topics in the field, it was encouraging to see that most of the topics outlined had been addressed by one of the 16 contributions during the meeting. How institutions might shape the supply and demand of education was addressed in several papers. In the presentation on “Does centralization foster human capital accumulation? Quasi-experimental evidence from Italy’s Liberal Age”, Gabriele Cappelli (University of Tuebingen) discussed a reform in early 20th century Italy that allowed municipalities to introduce school autonomy. Nuno Palma (University of Groningen) investigated how growing up under a more or a less autocratic regime in Portugal in the early 20th century affected literacy in his presentation on “A tale of two regimes: educational achievement and institutions in Portugal, 1910-1950”. A lively debate evolved after the presentation on whether Portugal in the early 20th century could still be understood as a developing country making the use of height as a measure of living standards viable. Giovanni Prarolo’s (University of Bologna) presentation on “Eight Centuries of Exposure to Pre-Industrial Politico-Economic Institutions and Current Socio-Economic Development. Disaggregated Analysis for Italy” evolved around the question whether pre-industrial institutions in Italy might explain tax evasion today which gave way for further presentations on the matter of persistence. Felipe Valencia (University of Bonn) presented his paper on “The Mission: Human Capital Transmission, Economic Persistence and Culture in South America” which investigates whether the missions of the Jesuit order in South America had long run-effects on educational outcomes and income. Piotr Kory (University of Warsaw) and Izabela Korys (National Library of Poland) equally concentrated on long-run effects, by looking at the consequences of the Polish partitions on book reading as a measure of social cohesion in today’s Poland in their presentation on “Literacy, education and development in Polish regions. Do we really observe the long-term effects of partitions?”. The presentation by Paola Azar (Universitat Autonoma de Barcelona) on “Efficiency gains and fiscal effort Evidence for public education spending (1970 – 2010)” shifted the focus to the financing of education in Latin America. Dacil Juif’s (University of Wageningen) presentation on “The Human Capital of Iberian Jews and Other Minorities during the Inquisition Era” added the aspect of religion to the process of human capital acquisition by using data from the Inquisition’s trials to measure the human capital level of Jews as compared to other parts of the Spanish population. Four presentations evolved around the topic of inequality in education. Jabrane Amaghouss (Cadi Ayyad University) looked at the interplay of inequality in education and economic growth in his presentation on “The Dynamics of the Reduction of Educational Inequalities in Africa”. Marc Goni (University of Vienna) looked at how the provision of schools was affected by the institution of school boards in his presentation “Landed Elites and Education Provision in England and Wales. Evidence from School Boards (1870-1899)”. Julio Martínez-Galarraga (Universitat de Barcelona) relatedly looked at how the (re-)distribution of land through the Spanish Reconquista affected human capital accumulation in the presentation on “Land access inequality and education in pre-industrial Spain”. Finally, Myung Soo Cha (Yeungnam University) looked at the consequences of land inequality on human capital from the Korean perspective in his presentation “Land Inequality and Human Capital Accumulation in Korea, 1910-2010”. Chiara Martinelli (Central Library, Council of the European Union) presented a new dataset on industrial schools in Italy and described the enlargement of industrial and artistic industrial schools in her presentation on “Did Industrial Workers Attend Industrial Schools? A Dataset on Industrial and Artistic Industrial Schools in Italy”. My (Ruth Maria Schueler, Ifo Institute) presentation shifted the focus to the non-cognitive outcomes of education in the presentation “Nation Building and Social Capital in Prussia: The Role of Education” by investigating whether a higher share of state funds in educational expenditures succeeded in aligning Prussian voters with the state’s ideology. Finally, a last set of papers evolved around the topics of health and fertility. Anastasia Driva (University of Munich) investigated the effects of a health reform in Imperial Germany on mortality in the presentation “Compulsory Health Insurance and Mortality”. Maarit Olkkola (UPF and National Institute for Health and Welfare) looked at a special form of birth care in Finland in her presentation on “Poor Cognition – Early-life Socioeconomic Status and Cognitive Abilities in Adulthood. The Helsinki Birth Cohort Study 1934–1939”. Finally, Philipp Ager (University of Southern Denmark) investigated the interplay of agricultural income and fertility. Not only the range of topics within the field of the “Economic History of Education” which was covered by the presentations was showing an encouraging development in the field, many presentations at the same time also introduced new datasets. The conference dinner at the seashore of Barcelona nicely complemented the dense program and the local organizers Alfonso Herranz-Loncán and Sergio Espuelas Barroso ensured a smooth sequence of the workshop. Martin Uebele (University of Groningen) represented the FRESH board. The rise of the middle class during the process of economic development has become a major research topic. This has been fuelled by the expansion of this social group in Latin America during the last decade. The Brazilian case is extra interesting due to the country’s recent economic growth accompanied by decreasing inequality, the reduction of absolute poverty and the rise of a new middle class. Between 2001 and 2010, Brazil’s GDP per head recorded an average annual growth of 2.4 per cent. Meanwhile, over the same period, 35 million previously poor people entered the middle class, enlarging the size of this class from 38 per cent of the population in 2002 to 53 per cent in 2012. Comparable episodes of rapid economic growth took place in Brazil in the past. Yet, little is known about the evolution of inequality and the presence of a middle class in Brazil over longer periods of time. Did a middle class exist in pre-industrial Brazil? How did it evolve until modern times? 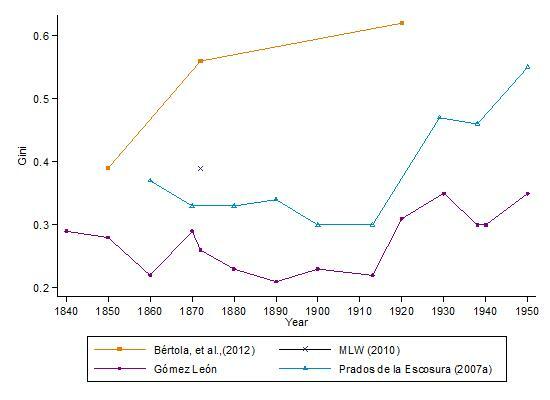 In a recent EHES working paper, The Rise of the middle class, Brazil (1839-1950), I investigate the emergence and evolution of the middle class in Brazil between the mid-nineteenth and mid-twentieth centuries and its connection with inequality. To this purpose Brazil’s income distribution is explored from two dimensions: inequality and polarisation. From the inequality perspective, the paper gets into the debate on whether or not Brazil suffered from persistent inequality from the colonial era by providing a new continual series on Gini estimations. Then, from the polarisation dimension, it contributes by presenting a new middle class index (MCI), based on polarisation measures, which is applied to assess the evolution of the middle class in terms of income and also in terms of status. Notably, to calculate both inequality and polarisation, I use a self-constructed social table involving information on active population structure (by profession) and the income linked to these professional categories, taking into account differences in gender (male or female), condition (free or slave) and area (urban or rural). The investigation aims to fill the gap in the literature on Brazil’s income distribution before the mid-twentieth century as well as provide new insights on when the middle class emerged in Brazil and if there was any connection between the rise of the middle class and inequality. This work yielded many interesting results. To begin with, results on inequality do not support the idea of persistent inequality in Brazil rooted in the colonial era (Bértola et al, 2012), while they do coincide with the hypothesis of low inequality levels associated with low income values (Milanovic, Lindert and Williamson 2010; Prados de la Escosura 2007). The figure below reflects this idea by showing that my Gini coefficients range between 0.2 and 0.35. It also shows a long-run decline in inequality until 1913, which was interrupted by a short-lived increase during the 1860s, followed by a reduction and a sharp increase from 1913 onwards. The figure below suggests that low Gini values are quite plausible given the low income levels exhibited in Brazil, especially during the nineteenth century. This figure shows Brazil’s Inequality Possibility Frontier (the maximum attainable inequality for Brazil given its overall income) with the maximum Gini ranging between 0.3 and 0.6. My estimates remained below this frontier, starting from 0.2 at the beginning of the period and growing later from 1913 once GDP per head had begun to increase. Initially, these inequality trends might be interpreted as supportive of the presence of a middle class over the period, especially up to 1913 (when Gini coefficients were falling) with a reversal thereafter. The alternative interpretation, however, could be that low inequality values in the nineteenth century, since they pointed to low income levels, might have prevented the emergence of the middle class. The opposite could have happened during the twentieth century, when high inequality values could have been linked to an early phase of economic growth in a Kuznetsian sense (that is, to the transitional process from the traditional sector to a modern one), allowing for the appearance of different social groups. Ambiguous interpretations can be solved by applying polarisation measures to infer the presence of the middle class. In particular, I propose to use a new middle class index defined as the ratio between tri-polarisation and bipolarisation (further developed in section 3 of the paper). The method allows me to assess the evolution of the middle class evolution in terms of both income and status. Results from the MCI (Figure 3) suggest that the middle class in terms of income arose in the late nineteenth century, when the decline of the slave system led to a more competitive social order. Still, its emergence, in terms of both income and status, should be placed during the first three decades of the twentieth century, in a context of the expansion of industry and modernisation. Yet, between 1930 and 1950, still in a context of urbanisation and growth but increasing inequality and social repression, the middle class started to decline in terms of both income and status. Brazil 1839-1950: Middle Class index (according to status and income) 5- year moving averages. In summary, substantial social structural change occurred in Brazil over the period under review. The decline of slavery (started in the 1850s), the reduction of inequality (during the late nineteenth century), and the process of modernisation and urbanisation (from the early twentieth century) were crucial factors for the emergence of the middle class. Interestingly, during the early twentieth century, the increase in inequality linked to the increase in wage differences (associated, in turn, with productivity differences) did not impede, but rather fostered the rise of the middle class. Yet, from the 1930s the continuous increase in inequality, along with a low social cohesion, frustrated the consolidation of the middle class and the eradication of absolute poverty. These results have relevant policy implications for recent theories on the emergence of the middle class in emerging economies in contraposition to their decline in Southern-European countries (after the last global financial crisis) and its connection with inequality. In the short-run: Is inequality when associated with modernisation unavoidable/ favorable to the emergence of the middle class? However, in the long-run: Does inequality impede the consolidation of the middle class even in the presence of economic growth? Another interesting question arising from this research would be the comparison of the rise of the middle class in other transitional economies in the past. 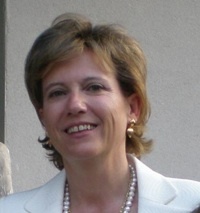 Bértola, L., Castelnovo, C., Reis, E., & Willebald, H. (2012). Income Distribution in Brazil in 1870-1920. XVII Jornadas Anuales de Economía, Banco Central del Uruguay, Montevideo. Milanovic, B., Lindert, P. H., & Williamson, J. G. (2010). Pre-industrial Inequality. The Economic Journal, 121(551), 255–72. Prados de la Escosura, L. (2007). Inequality and Poverty in Latin America: A Long-Run Exploration. In T. Hatton, K. O'Rourke, & A. M. Taylor (Eds. ), The New Comparative Economic History (pp. 291-315). Cambridge, Mass: MIT press.